Fresh off curating and exhibiting “The Drawing Room“ at Thinkspace, Audrey Kawasaki announces the release of her “She Who Dares” print for November 16th. This print was first available at her Mondo Bizarro show but some were held back for sale at her online shop. Giclee print on archival hahnemuhle paper. Size: 18″ x 21″ on a 20″ x 23″ sheet (with frame: 21″ x 24″ x 1″). Signed and numbered edition: 200 (115 of them will be available). Price of unframed: $220 (framed: $380). Where: On her website. In order to purchase you must be registered. Framed: conservationally with UV-coated acrylic, acid-free backing and spacers to allow the print to breathe. Categories: Art, Low Brow & Pop Surrealism, Releases. 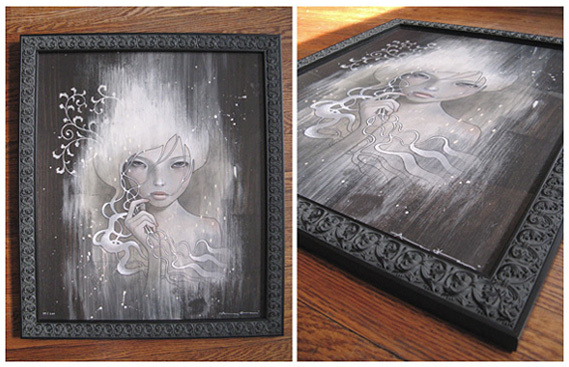 Tags: Audrey Kawasaki, Low Brow & Pop Surrealism, Prints.